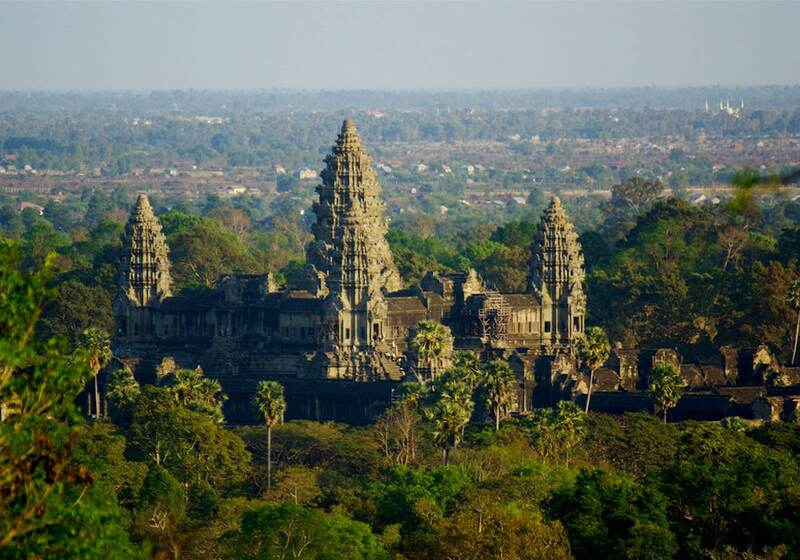 Angkor Wat is the famous, historical and mystical temple complex – which is one of the largest religious sites in the world – has become a wonderful site not to be missed. Angkor Wat translates into English as the ‘City of temples’, the name is not surprising since this architectural beauty has played a core role throughout history during the Angkor Empire and the many religious movements. The temple complex is so diverse and enormous that it is worth planning the trip with care to ensure you get the most out of the visit and more importantly understanding how the temples fit into the surroundings daily lives. This post aims to shed some light on the best ways to experience Angkor Wat sunrise and provides useful information for planning that extraordinary trip. You will start your journey at Angkor Wat early in the morning, therefore we recommend you to buy your ticket a day before to avoid disappointment. There are three times to visit the temples, sunrise, during the day and sunset. Whilst most people aim for sunset, if you can force yourself to get up around 4:30 am for sunrise at Angkor Wat it will get you that picture perfect shot – just don’t expect it to look like the colourful postcards. However, you can definitely enjoy the stunning views and watch how the rising sun brings the temples to life. Although it early remembers it is also the coolest part of the day. The seasons in Cambodia are split between the dry (October to April) and wet (May to October) season. The best time to go for sunrise is during the dry season where it less cloudy allowing for that quintessential shot. Also useful to note is the location. Be prepared for a number of like-minded tourists and be sure to stand your ground when you find a good location. We recommend standing by the pool inside the Angkor Wat complex to get the reflection effect. 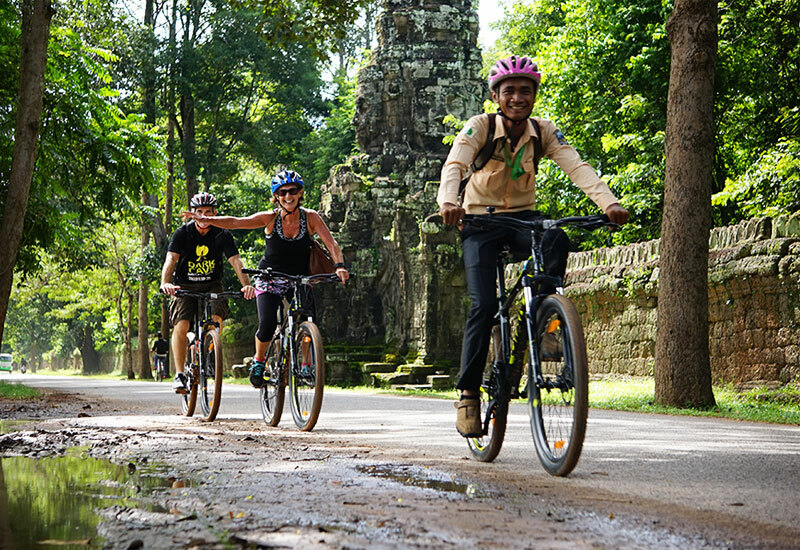 There are numerous ways to explore the carved out this magical temples, but the best way, cutting out traffic, offering freedom and the opportunity to engage with the locals is to visit Angkor Wat by bike. 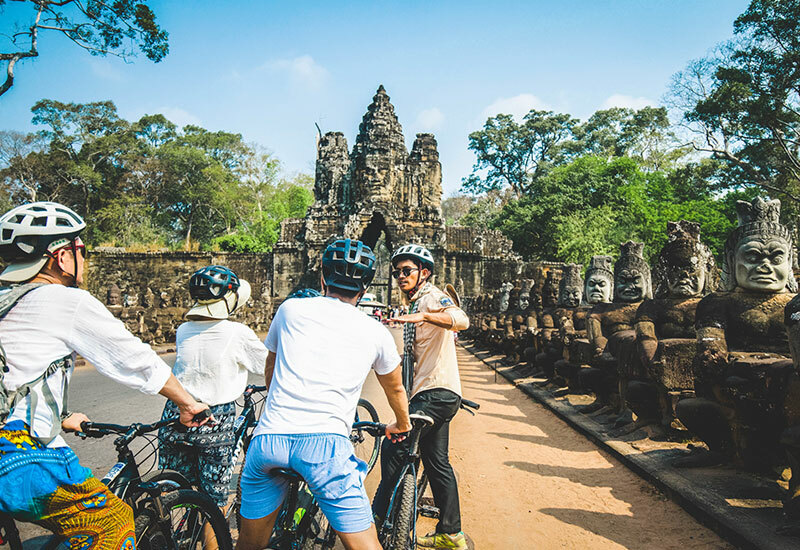 More specifically a bike tour will allow you to gain a deeper understanding of the significance of the temples whilst not having to worry about planning out a route. To visit a Heritage Site, layered with history and symbolism would be silly not to have a guide to help steer you through the crowds and provide that knowledge which takes you on a journey through stories and ancient lives. It also allows you to get off the tourist roads and venture into the jungle that entangles the temples. At Siem Reaper, you will get a trusted local guide to ensure you receive as much information as possible and that all your needs are met. Through the tour, you can understand the meanings behind the carefully sculpted walls or why there is a moat around Angkor Wat and everything was constructed with such precision and religious symbolism it is essential to undercover all the mysteries. Vathana has worked many years in the travel industry and has a wealth of knowledge and experience of different cultures and working practices. He really enjoys meeting travelers from other countries to learn and share experiences. Let be inspired by his travel advice and storytelling.